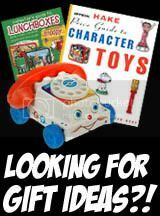 Vintage Toys & Memorabilia: FREE DESKTOP WALLPAPERS: Toy Ride Car MARX-MOBILE ELECTRIC-DRIVE! 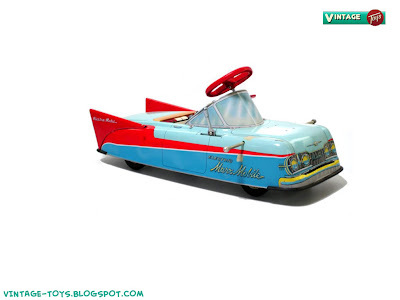 FREE DESKTOP WALLPAPERS: Toy Ride Car MARX-MOBILE ELECTRIC-DRIVE! Here's a nice set of 2 Wallpapers you can use to brighten your desktop or place in a MySpace Layout. 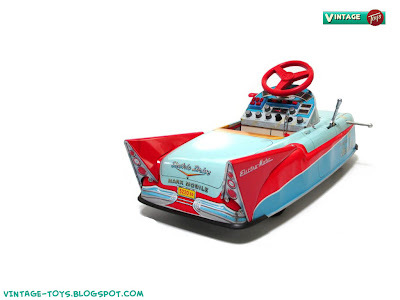 This is an extremely cool Vintage Toy, The MARX-MOBILE ELECTRIC-DRIVE Toy Car Ride. It's Electra-Matic!! Great pic! I was lucky enough to get 5 of these cars --- 3 in original boxes --- I broke my rule of not opening "sealed original boxes" but I opened one and put the car together with the full color poster instructions included in the box. I've never tried putting a hot shot 12v battery in it --- to see how well they run --- been tempted though! I've never seen much info about these cars ever posted anywhere and was thrilled to see your post here! I did see the 1953 version of this car (without the tailfins) in a 1953 Sears Christmas catalog. I stumbled on one of these in my parent's basement in the early 70s when I was around 6-7. It was pretty well rusted being in that damp basement and the 12v battery had long since been removed, but we did try it out in the driveway. It was slow rolling with the gears but it was still pretty cool. Thanks for the picture!! !